A Workarea application presents a retailer’s catalog to consumers and promotes the sale of those items. Products are representations of the goods and services the retailer is presenting for sale. This guide further explains “product” as a concept within the Workarea platform. A retailer’s catalog is modeled within the Workarea Catalog as products and variants (which each have details) and catalog product images. Additional records exist outside the Catalog module to represent the inventory, pricing, and shipping details for each item. Presenting a product requires wrapping the catalog product document in an appropriate view model, which creates a view of the product suitable for either consumers shopping in the Storefront or administrators managing the catalog in the Admin. Admins manage products, variants, and product images through the Admin web interface and data files. Developers have additional access to command line and programmatic interfaces. Regardless of interface, product management is affected by various application and document states. Admins also manage the placement of products within the Storefront, optimizing what products consumers see while browsing. The systems that facilitate these optimizations rely on additional product representations of which developers should be aware. Additionally, each presented product is affected by various browsing states. After narrowing to specific products, consumers view the details of each product, which presents options the consumer can use to reduce the product to a specific item. The display of the options and other product data are determined by the product template and several states related to showing a product. Each retailer maintains a catalog, a list of items for sale. These items are often goods with physical inventory, but may also include intangible items such as digital downloads and warranties, and services, such as units of repair time or tech support. Regardless of type, the retailer maintains records for each item, such as its description and details, pricing, inventory, location within a warehouse, and shipping weight and dimensions. These records are often managed across many systems, such as point of sale, inventory, accounting, warehouse/fulfillment, and mail order catalog. To manage each item across systems, the retailer identifies each item with a SKU: an id internal to the retailer and unique across all the retailer’s systems. The Workarea platform is similarly divided into multiple subsystems, many of which keep their own records for the retailer’s merchandise. These records are related by SKU, allowing multiple representations of the same item to be joined when needed. Within the Workarea::Catalog namespace are Product and Variant application documents. A catalog product represents a group of related but varying items for sale. Each catalog product embeds a collection of variants, each of which represents a distinct item for sale within that product. Grouping items facilitates the usual shopping flow: first reduce the catalog to a product of interest (such as a cotton t-shirt), and then further reduce that product to a particular item to be purchased (for example, the large, blue cotton t-shirt). The first part of this flow is known as browsing, where consumers shop by product. The second part is known as showing or product detail page, where consumers see options, which allow easy comparison of a specific product’s variants. Grouping into products also benefits the retailer, allowing them to share data across items, attach discounts to groups of similar items, and view analytics by these groupings. A product names and describes a group of items and stores the data that all the items in the group share. The only required field is name. Print a product as a document to get an overview of the catalog product interface. Notice above that several of the fields are internationalized; their values are keyed by locale. Also observe the embedded collection of variants. Each variant represents a distinct variation of the product, giving it a name/id (through the id, sku, and name fields), description (through details), and an administrable position relative to its siblings. You must provide the sku value when creating a variant, since this is a retailer-supplied ID that Workarea cannot generate. The variant’s SKU relates the variant to other models representing the same item within Workarea, and to other representations of the same item across other systems managed by the retailer. Note that product and variant implement some of the same interface. One example of this is active, which both models inherit from Workarea::Releasable. Another example is the details interface, covered next. Product and variant both inherit from Workarea::Details and therefore implement the same details interface. Details are administrable attributes of a product and its variants, which are displayed to consumers within the Storefront. A product and each of its variants stores a details hash, where the keys are typically strings and the values are collections of non-blank, scalar values (again, often strings). These are flexible data structures that serve platform-defined and application-defined purposes. The items that make up a product share some details and vary on others. Store the shared details on the product. Store on each variant the details that distinguish that variant from its siblings. Many examples of this follow. Note that a variant’s SKU effectively encodes its details, by providing an ID which maps to a particular “configuration” of the product. This encoding may be observable in the ID itself. For example, the SKU TSHIRT-BLACK-SMALL clearly identifies a particular product (T-Shirt) and particular variant details (a color, black, and a size, small). The following examples demonstrate the process of mapping catalog data to products and variants. Each example provides a possible solution and some commentary. The first example is presented in Table 1 and Listing 1. 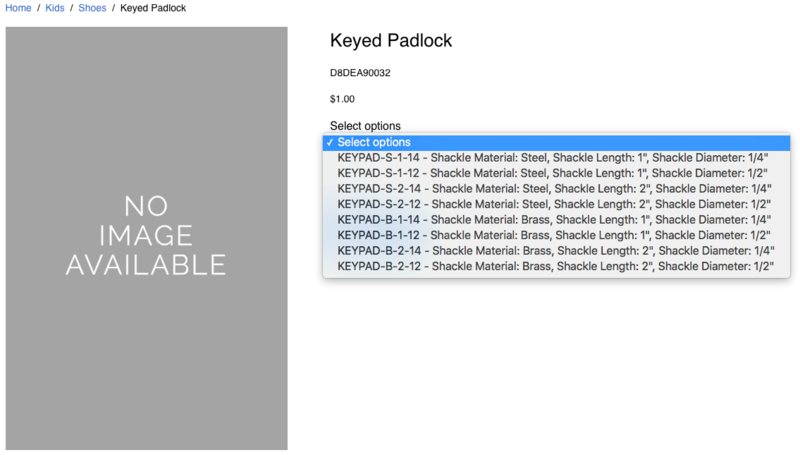 A subset of catalog data for keyed padlocks. KEYPAD-S-1-14 Covered Dual ball bearing Steel 1" 1/4"
KEYPAD-S-1-12 Covered Dual ball bearing Steel 1" 1/2"
KEYPAD-S-2-14 Covered Dual ball bearing Steel 2" 1/4"
KEYPAD-S-2-12 Covered Dual ball bearing Steel 2" 1/2"
KEYPAD-B-1-14 Covered Dual ball bearing Brass 1" 1/4"
KEYPAD-B-1-12 Covered Dual ball bearing Brass 1" 1/2"
KEYPAD-B-2-14 Covered Dual ball bearing Brass 2" 1/4"
KEYPAD-B-2-12 Covered Dual ball bearing Brass 2" 1/2"
Listing 1 Creating a “Keyed Padlock” product (with variants) in Workarea from the data in Table 1. This represents one possible solution. The values for Weather Resistance and Shackle Locking are consistent across all items and are therefore stored on the product. The items vary by Shackle Material, Shackle Length, and Shackle Diameter, so those details are stored on the variants. The data uses English language and measurements. Since the details field is internationalized. You could store different values (such as metric units) using a different locale. Table 2 and Listing 2 provide another example. A subset of catalog data for fitted baseball caps. Listing 2 Creating a “Fitted Baseball Cap” product (with variants) in Workarea from the data in Table 2. This represents one possible solution. Materials are stored (on the product) as multiple values so they can be enumerated for display or other purposes. Now see Table 3 and Listing 3 for a third example. 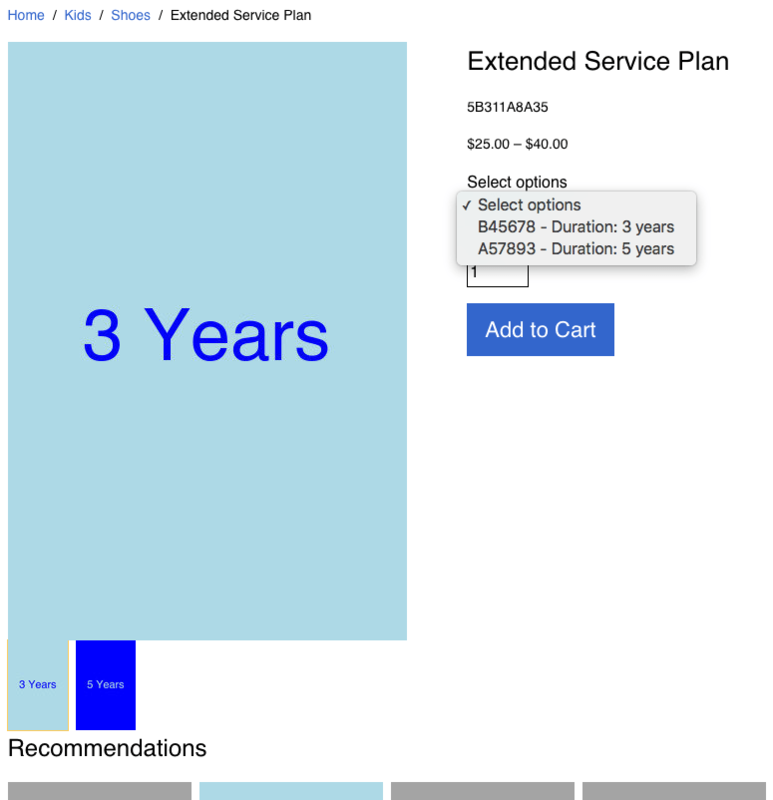 A subset of catalog data for extended service plans (warranties). Listing 3 Creating an “Extended Service Plan” product (with variants) in Workarea from the data in Table 3. This represents one possible solution. Notice in the 3rd example the SKUs aren’t as user-friendly as they were in the previous examples. However, SKUs are assigned by the retailer and should not be modified. Despite their cryptic appearance, they effectively encode the details of the variant by providing a unique ID that all relevant parties (retailer, Workarea, fulfillment system, etc) can decode. Also note the details in the 3rd example have only one value. In such a case, the retailer may prefer to assign a name to the variant and forgo the use of variant details. See Table 4 and Listing 4 for an example that fits this description. 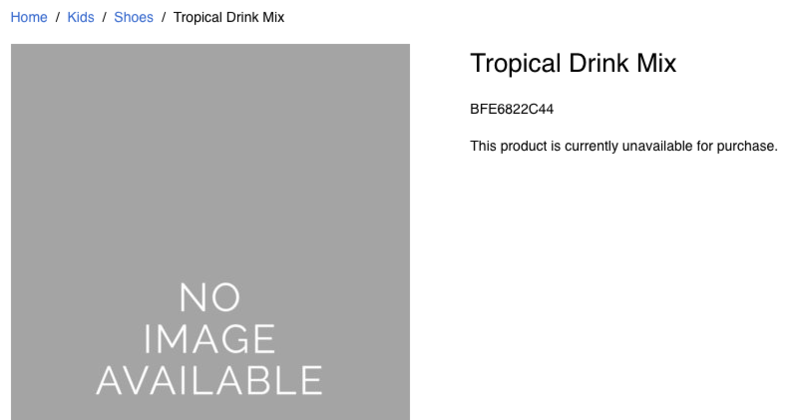 A subset of catalog data for tropical drink mixes. 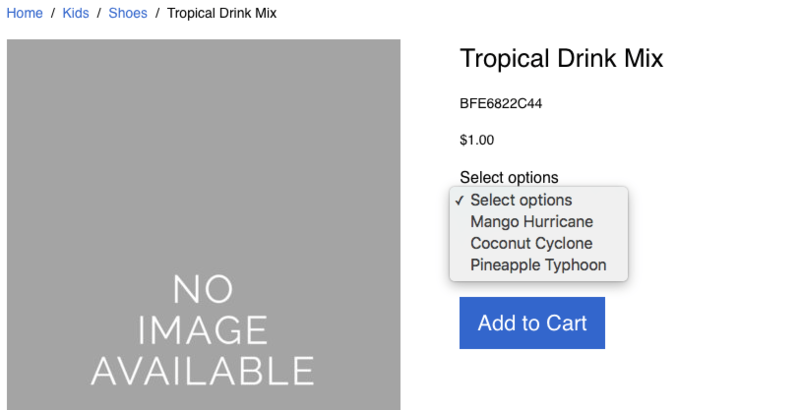 Listing 4 Creating a “Tropical Drink Mix” product (with variants) in Workarea from the data in Table 4. This represents one possible solution. As mentioned above, this final example assigns a name to each variant. These names may display to the consumer when showing the product. Review all the examples above and observe how some of them store details on only the product, only the variants, or both the product and the variants. Remember! A product and its embedded variants each store their own details hash, so consider which object to write to or query from when operating on details. Finally, products and variants implement instance methods for fetching and testing details. In addition to variants, each catalog product embeds a collection of product images. Each product image is a document of type Catalog::ProductImage and has an attachment (an image file). Product images are Dragonfly models and implement that interface. A product image also has a position field for administrating display order, and an option field to associate the image with a product option. 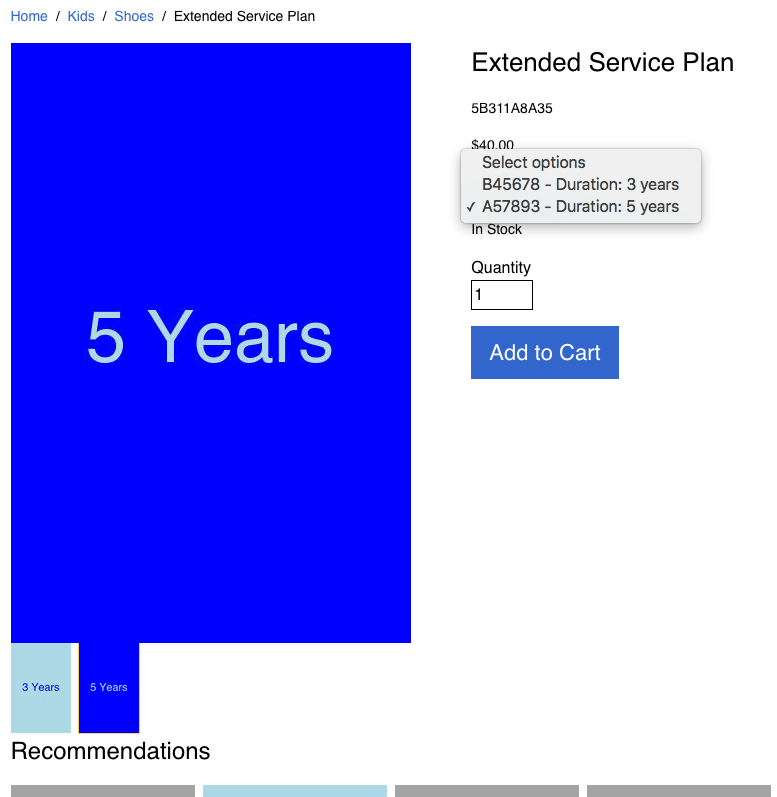 The following examples use the “Extended Service Plan” product created in Listing 3 for demonstration. 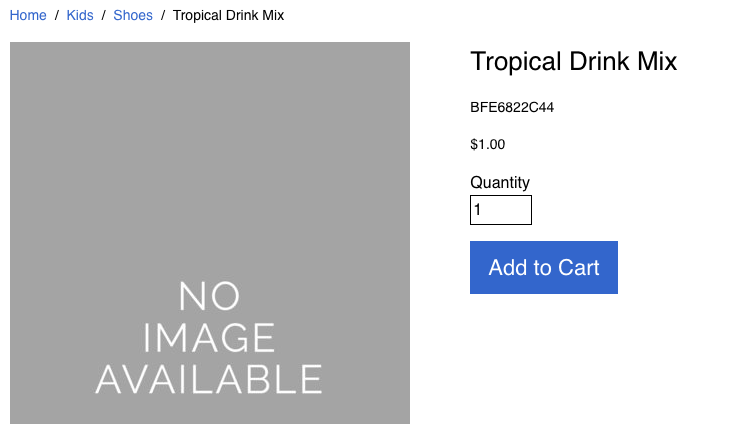 This product represents intangible goods that have no product photography, however, you can still use generated images to improve the shopping experience. First, generate some image files. Admittedly, these images are not pretty, but they demonstrate the concepts sufficiently. Next, create some product images within the product from those files, and explore the product image interface. Product images are neither releasable nor are any of their fields internationalized. Therefore, application state does not affect product images. Beyond the Workarea Catalog module, several other Workarea subsystems store records representing the items of the retailer’s catalog. These additional models are outside the scope of this guide, however, the following examples briefly demonstrate the relationships of these models. Notice the different method used to query for the product. This is because the SKU values are stored on the embedded variants, not the product itself. There are also some additional models that represent products for use within the search, recommendations, and analytics subsystems, which are related by product ID. These will be explored further in an update to this guide. Underlying each of the presented products is a Catalog::Product document. 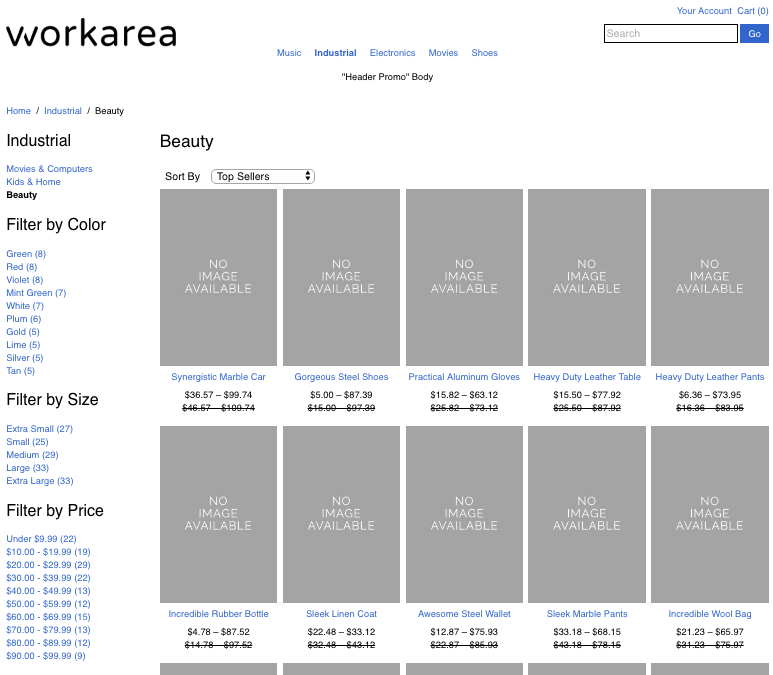 And like the Storefront, underlying each displayed product is a catalog product document. However, in figures 1, 2, 3, and 4, you can see the presentations of the products include data from outside the catalog product document. To display a product, a controller wraps a catalog product document in an appropriate view model which is responsible for presenting the document within a particular context (e.g. Storefront or Admin). The view model extends the model with additional presentation logic, and joins the model with the other models needed to create the representation of the product the user within that context is expecting to see. To demonstrate, consider the differing views of a product for consumers and administrators. Throughout the Storefront, each catalog product is wrapped in an instance of Storefront::ProductViewModel for presentation. The Storefront product view model is responsible for creating the view of the product a consumer is expecting to see in the Storefront while shopping. 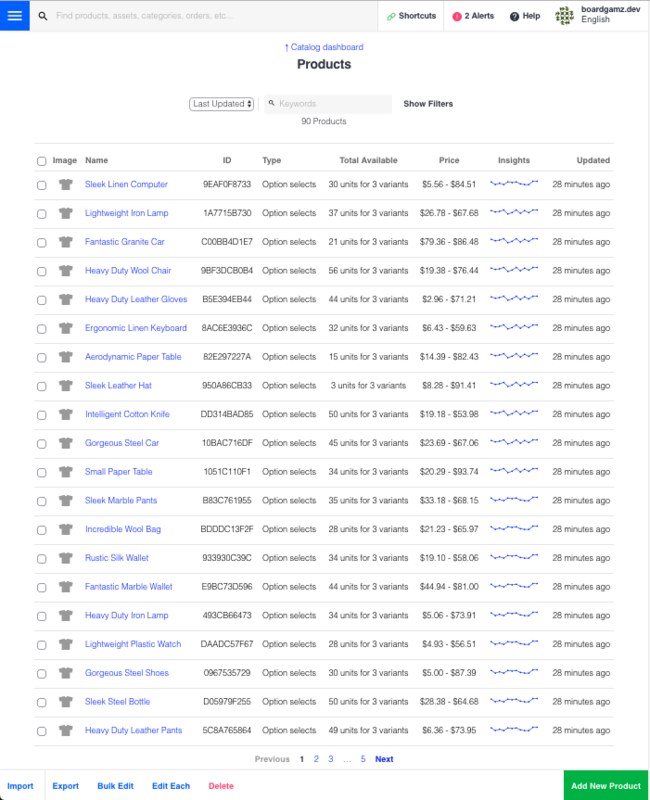 This view includes details beyond the catalog product, such as inventory, pricing, navigation, and recommendations (see Figure 1). The view model extends the existing interface of the catalog product and augments the interface with additional presentation logic and additional data joined from other models. In all cases, the changes to the interface reflect the context of a consumer shopping the Storefront and present a product which aligns with the consumer’s expectations of the “product” concept. Throughout the Admin, each catalog product is wrapped in an instance of Admin::ProductViewModel for presentation. This view model similarly extends and augments the catalog product interface, but for a different context: administrators responsible for managing the catalog and store. In all of these examples, the changes reflect the needs of an administrator rather than a consumer. Admins can toggle between these differing views of the same product using links in the Admin toolbar (in the Storefront) and the “View on Storefront” link (in the Admin). The Admin view of the product, introduced above, is the primary means for admins to manage catalog products, variants, and product images within Workarea. Workarea 3.3 also introduces data files, allowing admins to import and export data from JSON and CSV files for integration with another system or software application. Developers have additional access to programmatic interfaces with which they can extend the platform, and a command line interface for executing developer-only tasks, such as running seeds. Refer to figures 3, 4, and 5. Since products and variants are releasable, edits may publish immediately or in the future (with a release). Creating new products and copying products use multi-step workflows because both actions affect multiple models: the product, its embedded collections (variants and images), and the product’s categorization and navigation. Plugins and applications extend this interface, so your application may include additional features not listed above. Workarea 3.3 introduces importing from and exporting to data files (JSON and CSV). Imports/exports are accessible through the Admin, so administrators can use this feature to integrate Workarea with another software system (for example, importing catalog data exported from a warehouse, inventory, or POS system) or to view/edit Workarea data in another software application (such as a spreadsheet). Improvements to this feature are planned, such as a plugin to allow scheduling of imports and exports. A future guide will cover this feature in detail for developers. Since developers are typically super admins, they can use all the features of the Admin web interface. Finally, the Workarea API plugin provides a JSON over HTTP interface which allows management of products, variants, and product images. This allows for management of these models programmatically over the network. For example, another service can “push” product data to Workarea according to a schedule or events within the other system. Regardless of interface, be aware of application and document states affecting a given product. The current Rails environment (and current site if using Workarea Multi Site ) determine the database to which the MongoDB driver is connected. Therefore the entire catalog products collection will vary on these states. Furthermore, the current release and current locale may affect the field values of each product. All field values may vary by release (except for slug, which is explicitly not releasable), and the values of internationalized fields may vary by locale. It’s also important to understand how administrable fields affect the state of a product when presenting it to consumers in the Storefront. Administration of active (products and variants), purchasable, template, position (variants and images), and the administration and availability of inventory and pricing have various effects on products presented in the Storefront (see Product State While Browsing for browsing examples; product showing examples will be included in a future update). Beyond managing the products, administrators need to organize them within the store. Although consumers can navigate to products directly by their slugs (see Navigable), this has limited application outside of social media and email marketing. Consumers depend on the store to lead them to the merchandise they are looking for. Admins leverage this by managing the shopping experience in a way that entices consumers to buy. This process is called merchandising and involves a combination of automation (search, recommendations, analytics) and administration (navigation, content, pages, categories, search results customizations, recommendations settings, pricing, discounts). Administrators can manage what products are presented to consumers, along with where, when, and how. In each case, the products that make up the results are each wrapped in an appropriate product view model and presented to the consumer, as described above in Presenting a Product. Similar processes present products to administrators in the Admin within a variety of browsing contexts (search results, jump-to menu, index pages, dashboards). To produce the product results described above, some Workarea subsystems maintain their own representations of each catalog product. These additional models and their uses are not covered here in detail but are introduced to provide a complete picture of the “product” concept. Just as each item of the retailer's catalog is modeled across subsystems, so is each catalog product. Workarea's analytics module stores an analytics product (see Analytics::Product) in MongoDB for each catalog product. Analytics products collectively provide the necessary data for product scores and aggregations, such as top sellers, most popular, and average selling price. The Workarea recommendations subsystem stores recommendations settings (see Recommendations::Settings) in MongoDB for each catalog product. Recommendations settings allow for administration of product recommendations, such as manually assigned recommendations, and the priority of sources used to provide automated recommendations. To facilitate real-time search, Workarea stores multiple search documents in Elasticsearch for each catalog product. 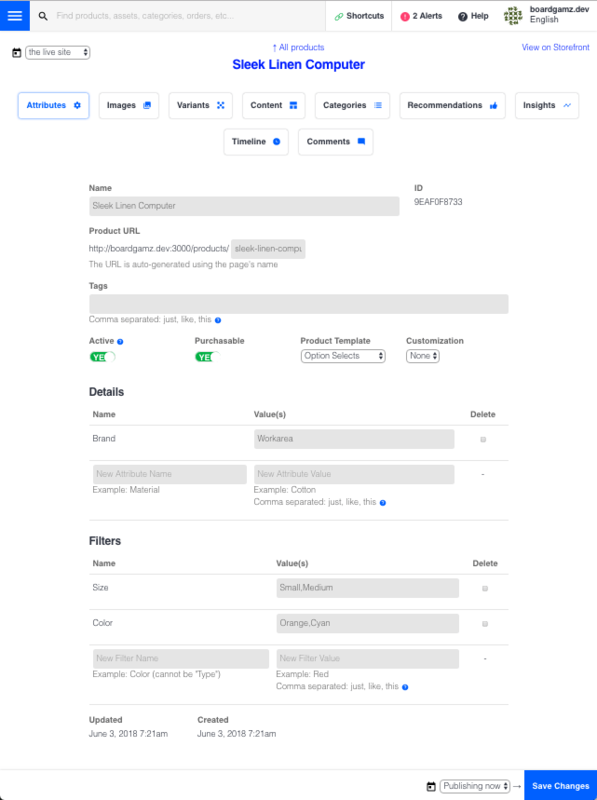 Unlike analytics products and recommendations settings, search product documents are derived directly from the corresponding catalog product documents. Search models such as Search::Admin::CatalogProduct and Search::Storefront::Product transform catalog product documents, joining fields within and across models as necessary, producing representations of the products suitable for real-time, full-text search (including matching, filtering, and sorting). The various representations of a product are related by catalog product ID. The following example demonstrates these relationships. In the example above, search_products returns a collection because there are multiple search products for each catalog product (one for each Elasticsearch index; the exact number depends on several factors, such as the number of configured locales and which plugins are installed). Also note the search product IDs are prepended with "product-". Each Elasticsearch index contains documents derived from various Mongoid document types, so the prefix is necessary to ensure uniqueness. Remember, the product representations described in this section are used to determine which products to show to consumers, but they aren't used to display the products. That responsibility belongs to the catalog product documents (and view models). As consumers browse the Storefront, the display of products is affected by various application and document states. The current Rails environment, the current locale, and the current site (if multi site) affect which Mongo database and Elasticsearch indexes are queried for products. Furthermore, the state of each Mongo document is affected by current locale and current release (release is applicable only when previewing the Storefront as an admin). Each of the merchandising subsystems introduced above has its own logic to determine which products are returned for a given query or criteria. In all cases, inactive products are excluded from results; that is, they aren't displayed to consumers in the Storefront. A product's activeness is administrable; the product and each of its variants has an active field. The value of this field varies by release and locale, so each combination of those application states may produce a different value for active. Furthermore, a product is considered active only if one or more of its embedded variants are also active. Each of these is involved in determining which fields are included/excluded and how they are arranged. Furthermore, the value of each field is subject to the current locale and current release (if present). The locale affects all internationalized fields, while the release affects nearly all fields. Lastly, the image used to represent the product while browsing—the product's primary image—is determined by logic in the view model used to present the product. The behavior may be affected by plugins and extensions, but the default logic is to use the first image, according to the administrable position of each image. The following example re-uses the product and images created in Catalog Product Images. 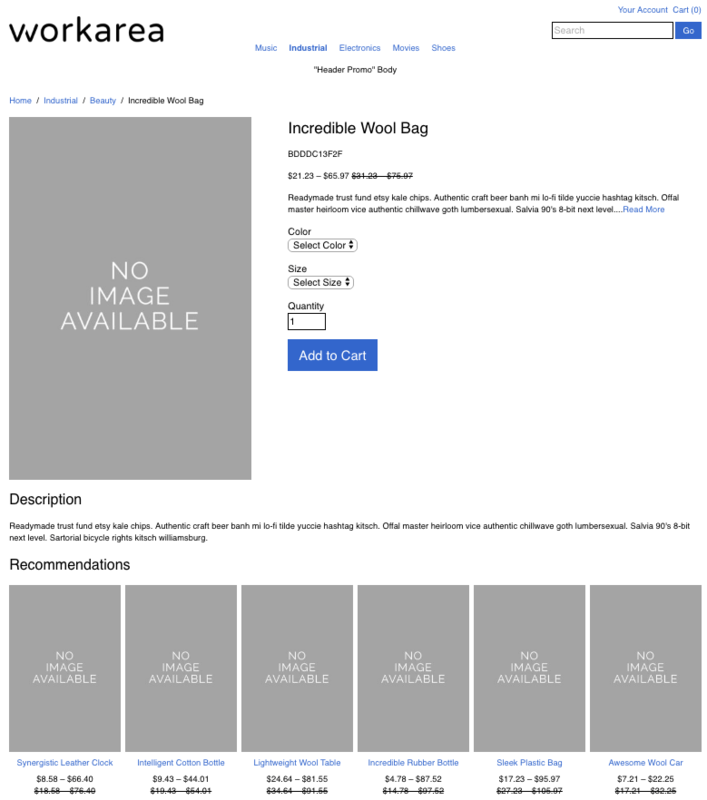 If the product has no images, the placeholder image is used. After browsing to narrow the catalog to a specific product, the show, or detail, page presents the product to the consumer with additional details: more images, larger images, a full description, recommendations, etc. Refer to Figure 1 for an example. The product show view presents the product's options, allowing the consumer to reduce the product to a specific item for purchase. Conceptually, product options are the distinct values from which a consumer may choose to reduce a product (a group of items) to a specific item (identified by its SKU) for purchase. The options are derived from the collective details of the product's variants, after flattening each member's values. Concretely, in code and UI, the term "options" may refer to several different data structures and UI abstractions, but in each instance, the usage is generally aligned with the concept of product options just described. Options (for example: Blue, Red, Large, Small) are typically grouped by name or key (for example: Color, Size) and presented as a multi-dimensional matrix, where the intersections represent the uniquely identifiable items that make up the product. To make this concrete, review the Keyed Padlock product introduced above. That product's variants collectively have 6 unique values, organized into 3 groupings. How these options are presented to consumers varies by template (templates are covered next). The following image shows the product displayed using the option selects template. Since the data is well designed and managed to this point, selecting a value from each of the 3 selects matches exactly 1 variant within the product. 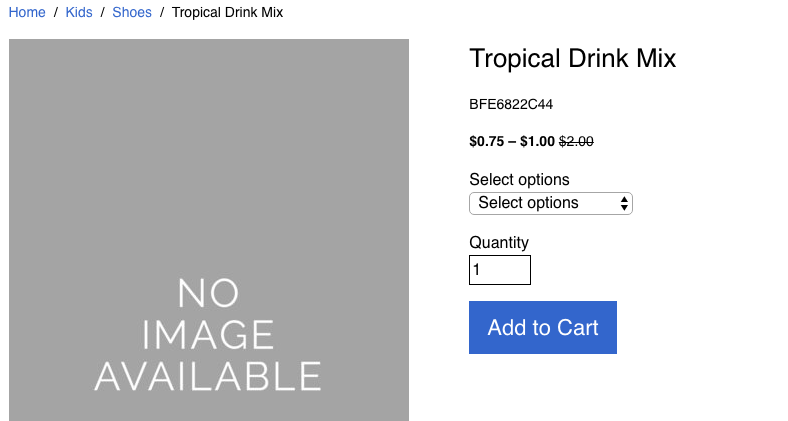 The SKU of that variant is used to identify the item to be purchased if the consumer adds to cart. Each product has an administrable template which is managed by admins and controls the presentation of the product in the Storefront. Specifically, each template is a combination of a view model and partial used to display the product in the Storefront. Workarea (since v3.3) includes 3 templates: Generic, Option Selects, and Option Thumbnails. However, your application may include more templates, since plugins and applications can add their own templates (see Add, Remove, or Change a Product Template). The following snippets provide some examples of how to find which plugins are available to your application and how to find the relevant code for the templates. These examples are for an application with several plugins installed and its own custom "Pre Owned" template. 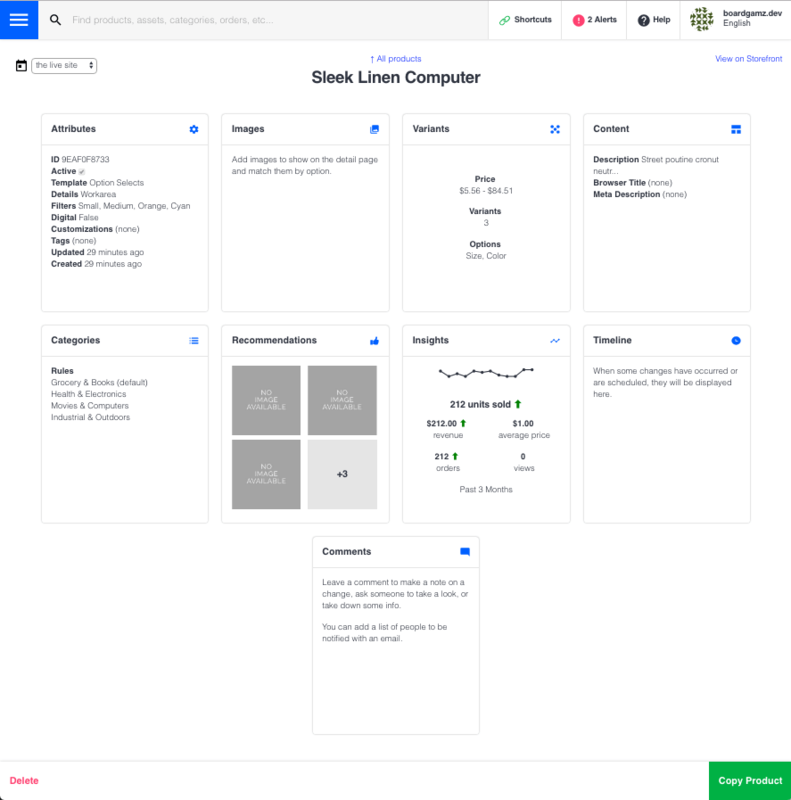 From the shell, list all product template view model and partial source code files that exist within your application and the specific version of the platform and plugins you are running. You can also do this search from your editor if that is preferrable. The Generic template uses the default Storefront view model, while other templates use a more specialized view model that inherits from the default Storefront product view model (for example, Option Selects uses Storefront::ProductTemplates::OptionSelectsViewModel). 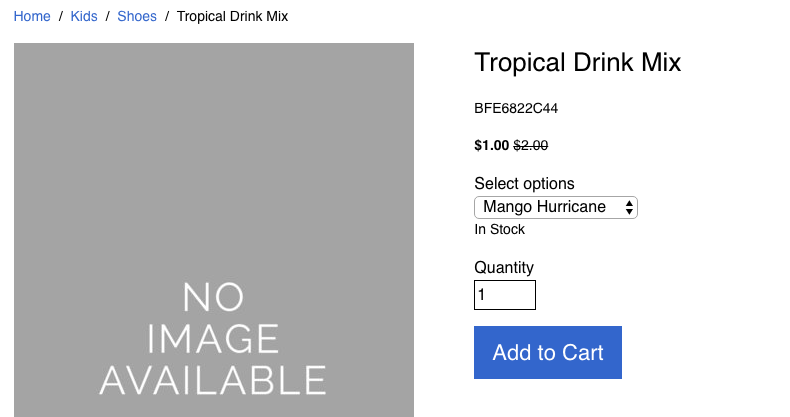 Within the Storefront, several states affect the display of a product when showing. Whether a product displays at all is affected by its activeness. Consumers cannot view inactive products. Navigating to an inactive product (e.g. from an email or bookmarked URL) results in InvalidDisplay (404 response). Admins can view inactive products in the Storefront. For a product to be considered active, it's active field must be true and it must have at least one active variant. Remember that the active field's value varies by locale (since Workarea 3.3). When showing a product in the Storefront, the product's template affects which fields are included/excluded, their current values, and how they are presented (the overall layout/design for the product). Since a product's options are derived from its variants' details, which options are included is determined in part by which variants are included. The Storefront product view model redefines the catalog product's variants collection to include only those variants that are active and have displayable inventory (the concept of displayable inventory is outside the scope of this guide). Therefore, variants that are inactive or whose inventory is not displayable are not considered when creating the options for the product. The following examples demonstrates how the product's variants collection and options are modified when presented for display in the Storefront. 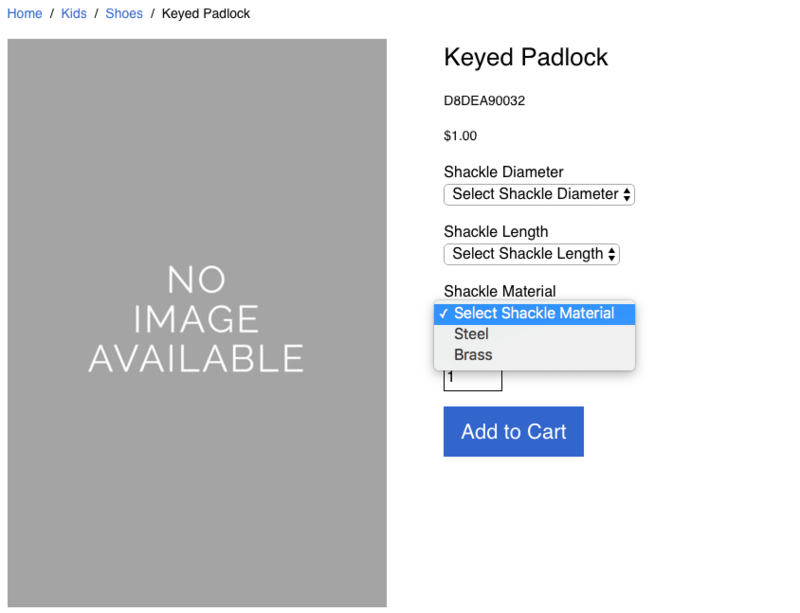 You saw above an image of the Keyed Padlock product displayed using the Option Selects template, where the options (for example Steel, Brass, 1", 2") are grouped by key (Shackle Material, Shackle Length). In contrast to this, the Generic template groups options by variant, essentially converting the matrix of options into a flat list of items. The Option Thumbnails template groups options by details key, like the Option Selects template. But it uses a different UI to present the options, which includes a thumbnail image representing the option, when available. As a consumer selects options in the Storefront, the UI updates asynchronously. The state of the option selections is stored as params in the URL. The generic template prefers the sku param (e.g. sku=KEYPAD-S-1-12, while the other templates prefer params that match specific options (e.g. Color=Blue,Size=Large). However, either type of param is respected by all templates. Requesting a product with these URL params will attempt to restore the indicated option state. Which images are shown and which image is selected depends on the product template and which options are selected. Remember that each image may be associated with a product option. The generic template always displays all the product images. 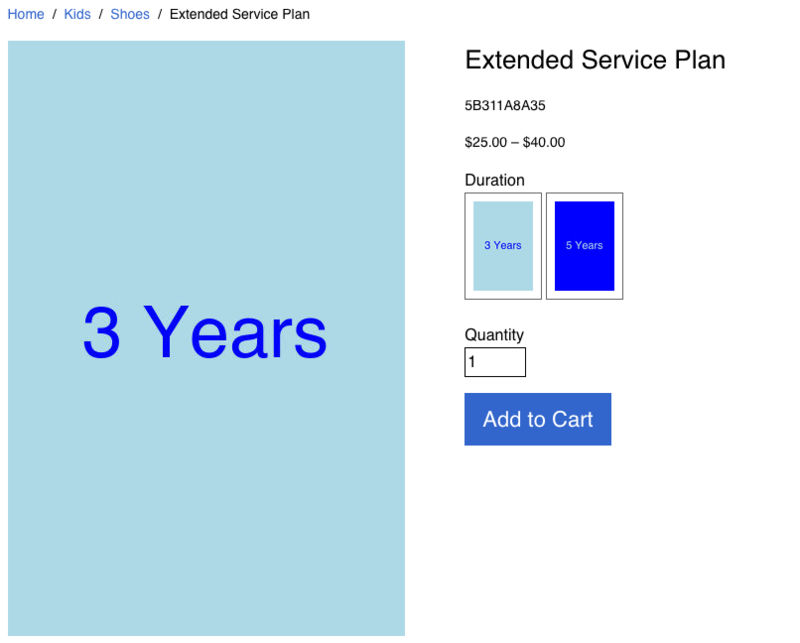 The following examples use the Extended Service Plan product from above, shown below using the generic template. When options are selected, the generic template will try to find images matching those options and will select the first such image. 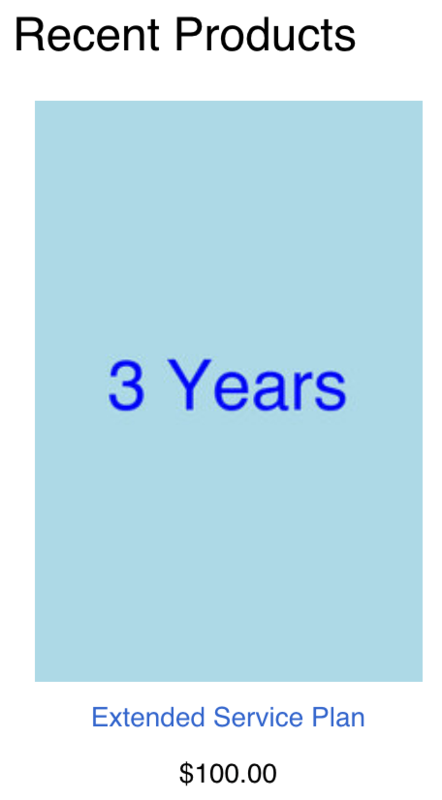 In the following screenshot, the "5 years" option is selected, so the image corresponding to that option is selected. Product templates other than generic will show only the images which match the selected options. The screenshot below changes the template to Option Selects. 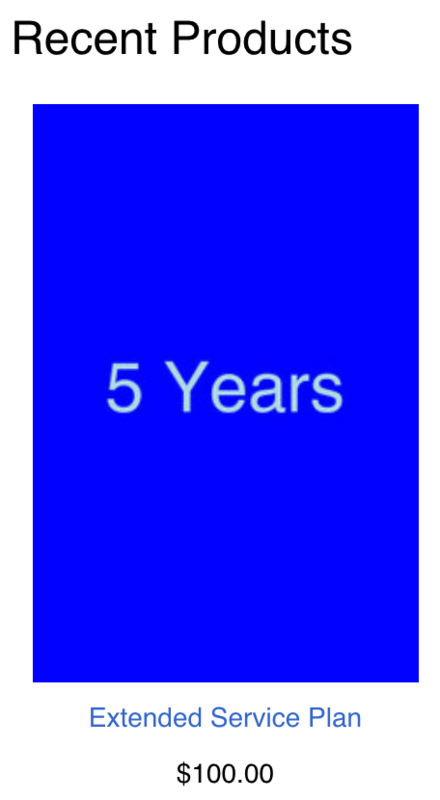 The image matching the selected "5 years" option is selected, and is the only image displayed. The other image does not match this option and is hidden. When no options are selected in this type of template, only the images that match the options of the product's primary image will be displayed (since Workarea 3.3.2). The selection of options also affects the display of pricing and inventory. The specifics of pricing and inventory are out of scope for this guide, but notice in the following examples how the selection of options affects the display of pricing and inventory. Once enough options are selected to identify a specific item, the item's SKU is used to look up specific pricing and inventory information. Without a specific SKU, the information is generalized (price ranges) or omitted (inventory). If you’re working with a catalog that isn’t organized this way, storing exactly one variant per product may be preferable. Upcoming additions to this guide will explicitly define and explain the concept of options, and further explore product browsing and showing. Templates and options will be covered in a future update to this guide. However, you may want to store the colors as separate values for the product’s filters. Filters will be covered in a forthcoming guide on searching products. Upcoming additions to this guide will provide additional examples of this in the context of showing products in the Storefront. You can change the image file used for the product placeholder image. A forthcoming guide on extending product images will provide step-by-step instructions. 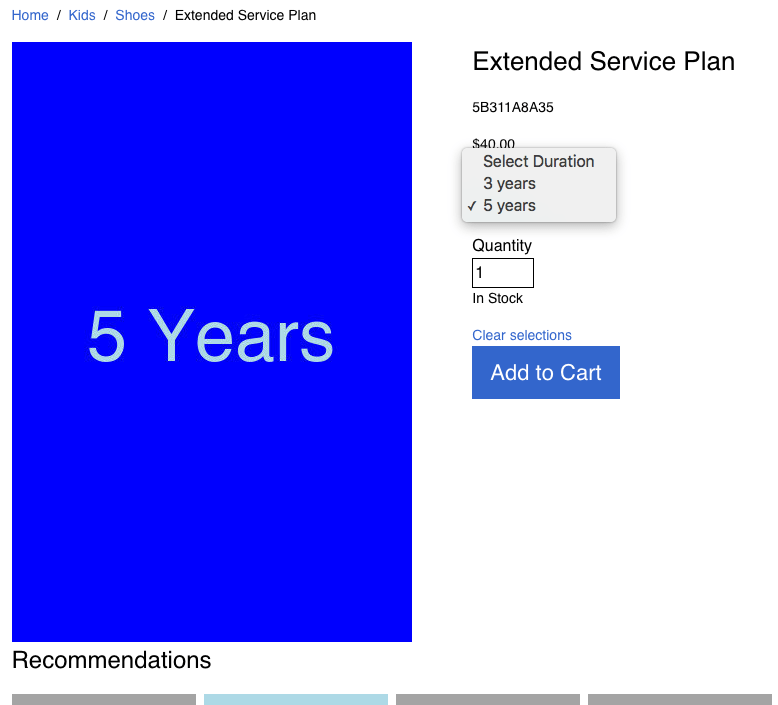 A future section on templates will cover additional product view models in the Storefront.